I’ve not done anything on the front yet, but I think the back looks pretty killer so far. 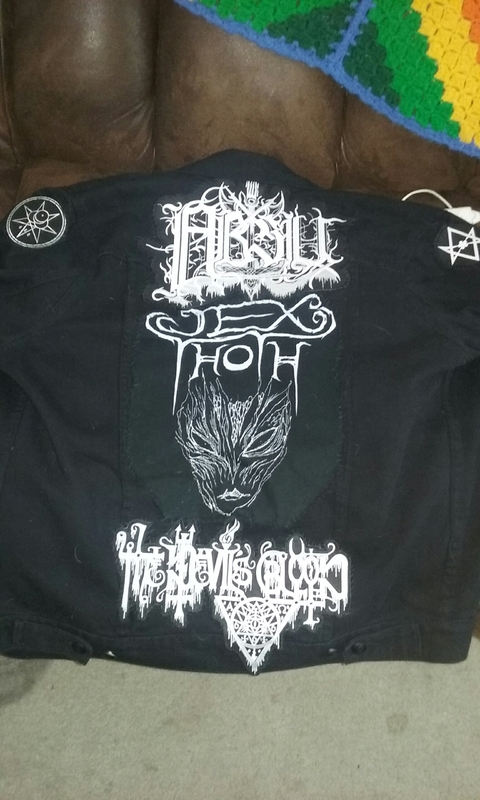 The Absu and The Devil’s Blood patches are embroidered whereas the Jex Thoth centerpiece is an old t-shirt that I sliced up and made into a patch of sorts. I’m pleased with what I’ve done to it so far and am excited about the next phase of construction. I did put a pair of Thelema patches on the shoulders but aside from that all I’ve done is the back. I want to accrue at least twenty patches so I can really play around with some possible layouts. Of course, twenty is just the beginning. My last project was half the surface area and used like fifty-seven patches. This has the potential to be a long and consuming project. Whatevers, I’m in it for the art. I’ve become a bit socially withdrawn lately. Not deliberately, but friends and my schedules just haven’t been lining up recently. This jacket project gives me something to exercise my brain and my hands. I try to take it easy on my hands but I also know a certain amount of work for them improves my overall dexterity. I’m having a far easier time than when I did my vest which is a testament to how much the Humira has improved things for me. I am really enjoying this project so far. I’ve gotten much quicker with my stitching and far better at undoing thread tangles with the gentle back and forthing of the line. Or whatever, sewing is just something I get by at honestly. My stitches hold, but they aren’t exactly pretty which is why I opted to use black thread this time and mostly hide the stitching. Anyhow, now I need to go upload this to tshirtslayer.com (Berserker666). Having said that, I wish you all a lovely day. This entry was posted in Uncategorized and tagged absu, autoimmune, battle jacket, humira, jex thoth, kutte, life, metal, rheumatoid arthritis, the devil's blood, writing. Bookmark the permalink.